I’m not sure when or how it happened, but Liam Neeson is now an action movie star. It might have something to do with those 'Taken' movies he keeps doing, but I haven’t seen any of them, so the idea of the lead from ‘Schindler’s List’ chasing people with a gun is still strange to me. Perhaps that works in favour for ‘A Walk Among The Tombstones’, his latest action flick. While some might be put off by seeing Neeson in another action role, I get the advantage of coming at it with fresh eyes. And for the most part, that is a very good thing. Matt Scudder (Neeson) is an ex-cop now working as a private detective at the turn of the millennium. He’s asked by drug trafficker Kenny Kristo (Dan Stevens) to help find two men who kidnapped and brutally slaughtered his wife. With the (reluctantly received) help from street kid T.J. (Brian 'Astro' Bradley), Scudder begins to uncover something far more sinister and horrifying: a pair of vigilantes targeting drug traffickers and making them and their loved ones pay in phenomenally cruel and twisted ways. Based on the novel by Lawrence Block, ‘A Walk Among The Tombstones’ certainly feels like a film from another time, a refreshing call-back to the great psycho-sexual thrillers of the 90s like ‘Along Came A Spider’ and ‘The Bone Collector’. It’s not an extraordinary or particularly memorable film in any way, but there is a sting in its tail that makes it worth your time. Where other thrillers would usually balk at the idea of delving into difficult or disturbing material, this film does so unapologetically, offering some genuinely distressing moments and two horrifying villains. Essentially what we’re watching is pretty much a police procedural, but it’s a carefully crafted one. Writer and director Scott Frank is meticulous with his decisions, in terms of the tone that balances lightness and darkness, the moral questions it throws up (we and Scudder are forced to sympathise with these drug traffickers under attack even though they’re reprehensible in their own way) and a consciously constructed visual style. This is a handsome looking film, beautifully shot by Mihai Malaimare and featuring some clever visual flourishes and colour grading. The performances are also excellent, Neeson retaining a glint in his eye at all times, even at the darkest moments, and has great chemistry with young actor Bradley. David Harbour and Adam David Thompson are genuinely chilling as the two kidnappers, and Stevens and Boyd Holbrook, who plays his brother Peter are also excellent. Like most of those nostalgic 90s thrillers, the film stumbles during its finale, which is a pity, as there’s a lot to recommend it. This is a very masculine film, almost devoid of any female characters who are instead figures discussed as lost or taken. ‘A Walk Among The Tombstones’ has enough to set it apart from most generic thriller rubbish that we get these days to recommend it, and as a massive fan of that genre, I found myself genuinely engaged. So if you like a good strong thriller or the idea of Liam Neeson running around with a gun (albeit not saving his daughter for the fifth time), this is definitely a film worth checking out. Roadshow have given the film an excellent if not extraordinary 1080p 2.40:1 transfer. As I said, this is a very good-looking film, and while detail and clarity are serviceable, the colours are what’s important here. This transfer beautifully maintains the careful palette used by Frank and Malaimare, especially with the blacks and greys. The DTS-HD MA 5.1 track is also very good, though dialogue is occasionally lost, which muddies the exposition. ‘A Walk Among The Tombstones’ certainly feels like a film from another time, a refreshing call-back to the great psycho-sexual thrillers of the 90s. We’re only offered two generic featurettes, but each do demonstrate the thought that went into the film, with intelligent discussion about the unusual narrative or tonal elements, the moral questions at the heart of the film and its place within the genre, Frank talking about the film as being as much a western as it is a thriller. They also talk about the decision to cast Neeson, and he explains what appealed to him about the film. Apart from that, you get the usual back-slapping (especially with Neeson) and how much everyone enjoyed making the film. Fine for a watch, but not re-watchable. The 'A Walk Among The Tombstones' competition has now closed. Winners will be announced shortly. Competition opens at 8pm AEDT on Sunday 15th February 2015 and closes at 11:59pm AEDT on Sunday 22nd February 2015. Five winners will be chosen at random on Monday 23rd February 2015. To successfully win, entrants must fulfil the above entry conditions before the time the competition closes. Current members/followers are eligible to enter the competition. Only one entry per person. Only one winner per household. To be a valid winner, the entrant must not have won a prize from SWITCH within the last 28 days. Each winner will receive one Ultraviolet Blu-ray copy of 'A Walk Among The Tombstones'. By entering, you agree to receive occasional emails from SWITCH in the future. If you decide to unsubscribe from these updates, any further entries will not be applicable. Only Australian residents are eligible to enter. 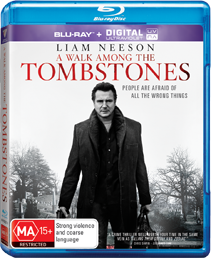 'A Walk Among The Tombstones' is available on Digital, Ultraviolet Blu-ray and Ultraviolet DVD on Wednesday the 18th February 2015 from Roadshow.